How can someone tell you they’re experiencing pain or discomfort that isn’t overtly visible, if they can’t communicate through speech? Professor Jeff Hughes from Curtin’s School of Pharmacy and Biomedical Sciences has created an app that gives a voice to people who are living with conditions that impact upon their ability to verbally communicate with others. One of these conditions is dementia, a neurodegenerative condition that affects the brain’s cognitive ability. It’s currently the second leading cause of death in Australia, and with the number of people living with dementia set to reach more than 536,000 by 2025, the demand for tools that help treat and manage the condition is sure to increase. Professor Hughes’ brainchild was the world’s first smartphone app for pain assessment and monitoring, developed under the banner of Curtin start-up company ePAT (electronic Pain Assessment and Technologies Ltd) from 2014. The start-up was acquired by PainChek Ltd in 2016, and the app is now being further developed and marketed by the company as ‘PainChek’. The app provides an accurate and reliable means for healthcare professionals and family members providing care at home to assess pain, and ultimately help to improve quality of life for those they care for. “A significant issue among people with advanced dementia is that they no longer have the communication skills to express the level of pain they are suffering,” Hughes explains. “The seriousness of their pain can often go unrecognised. But PainChek, a smart-device app, which utilises automation and artificial intelligence, allows for the detection and quantification of pain, based in part on a patient’s facial expressions. PainChek uses facial recognition and a 42-point pain scale to help healthcare professionals and family members decipher the level of pain being experienced by their patient or family member, allowing them to respond accordingly. A level between zero to six represents no pain, seven to 11 mild pain, 12 to 15 moderate pain and anything above 15 means severe pain. The tailored pain scale was developed by Hughes and his team through a tireless review of existing literature and tools, including the well-known Abbey Pain Scale, an observational pain assessment tool used nationally in the assessment of pain in people with dementia. PainChek automates pain assessment, allowing for the continual evaluation of pain, and providing the user with access to a personalised pain chart of their patient or family member, which has been mapped over an extended timeframe. The chart is designed to be used in conjunction with other information recorded on the app, which correlates with or affects pain levels, such as medication types and dosages, activity levels and behaviour. All recorded data is backed up when the device is connected to the internet. Since its inception in 2013, Hughes and his team have been working hard to assess and monitor the performance of the app. 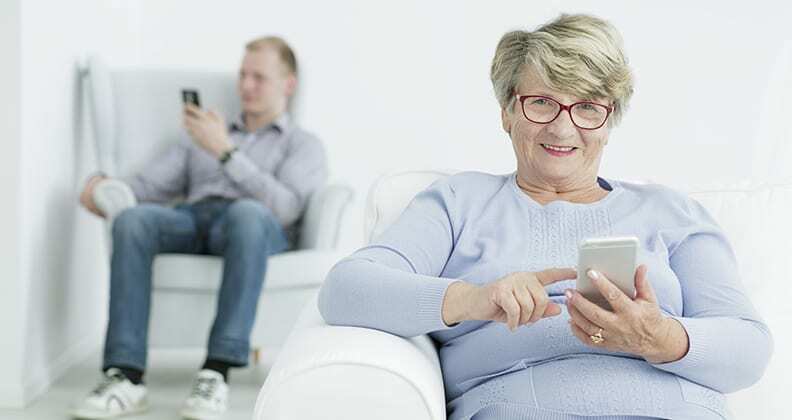 They’ve conducted validation studies with a range of Perth-based aged care providers, including Mercy Care, Juniper, Bethanie and Brightwater, comparing each generation of the app with the Abbey Pain Scale. Data from these trials was used to support the registration of the app as a Class 1 medical device in Australia (Therapeutics Goods Administration registration) and Europe (CE Mark) by PainChek Ltd. Trials in aged care facilities were successful, validating the functionality and purpose of PainChek. One of the residents living with dementia was previously cared for at home by her husband. He says the app has been an invaluable tool for assessing his wife’s constant lower back pain. In addition, the research has led to the development of a partnership with Dementia Support Australia, which comprises the two entities Dementia Behaviour Management Advisory Service and Severe Behaviour Response Teams. “Dementia Support Australia sends consultants out to assist in the care of people living with dementia who have significant behavioural problems,” Professor Hughes says. “What they had found from their own observations was that somewhere between 35 to 60 per cent of the people had undetected or undertreated pain, and they wanted the means to improve the assessment and documenting of that pain, and better demonstrate the effectiveness of their service. The development of the app hasn’t stopped there, with PainChek Ltd working on adaptations that can cater for other groups unable to communicate verbally: infants and pre-verbal children. “Twenty per cent of children have chronic pain, with common causes being headaches and gastrointestinal or musculoskeletal conditions. And that pain can produce a whole range of issues, such as behavioural problems, poor interaction with others and avoiding school. Most people think that little kids don’t feel pain the way adults do, but we’re learning this isn’t the case,” Hughes reveals. The intended impact of the children’s app is three-fold. One, to provide parents with surety about whether they’re taking the appropriate action. Two, to assist healthcare professionals in deciding what level of pain a child might be in and which medication to administer if applicable, and three, to encourage the investigation of the root cause of the pain to then seek the appropriate treatment. Much like the adult app, the children’s app contains a number of items to help assess pain, however, the facial recognition element is far more in-depth due to the fact that children typically use more pain-associated facial expressions than adults. As a result, Hughes’ team has been capturing videos of children who are in pain, primarily during the immunisation process, with each video contributing to a database of coded images. With a preliminary algorithm already built, PainChek Ltd plans to have the first prototype available for trialling in 2018. More information about the app can be found on the PainChek website.